Oh yes. Olive Films is releasing this glorious action classic. THE BOZ IN STONE COLD. I received a screener the other day and I must confess, Olive made the right choice in putting this out. It's a cult classic that hardly gets talked about. Why? I don't know. But seeing it finally hit bluray after way too long of a wait, hopefully brings a little more attention to this. In 1991, Brian Bosworth went from big time NFL flop to movie flop with Stone Cold, a movie where he plays a suspended cop who plays by...get this...NO ONE'S RULES...who gets blackmailed by the FBI to go undercover in a biker gang who also don't believe in the rules of society. Angered by the conviction of their gloriously bearded leader, the bikers cause all sorts of hell on beaches and blowing up old judges and a billion other shenanigans. 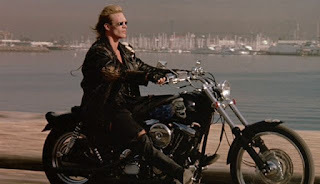 In a display of badass-dom, The Boz takes down criminals in some scene generic grocery store in the opening scene. Using a broom to take down one guy and his inner Boz powers to take down another, the movie opens up with the sense that you've picked a real winner. But even more cool than seeing the mulleted beefcake take down bad guys, is the cereal on the shelf. Batman, Hot Wheels and Ghostbusters cereal. RIGHT THERE. YES. It's been a while since I've seen this movie and I find it hard to believe I don't remember noticing the cereals. A cereal-lover and nostalgia purists dream. Now obviously, with a first time actor in the lead, you're gonna need some solid veteran actors to anchor down the production. Lance Henriksen and William Forsythe were enlisted to take care of playing the main bad guys. And considering the macho manliness of this movie, I'd say they were the right choices. This isn't a movie Arnold was gonna sign on to do. Sylvester Stallone, maybe if it were 1985, but for a movie released in 1991, the plot is a little hokey. But, Lance and William do their best to make this watchable. 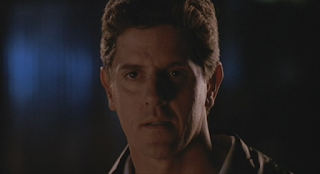 Also appearing, character actor Sam McMurray. While he's known for other things, he'll always be the sleazy father in law in the Wizard to me. So that's a nice bonus. Not They Live but the action is there. Early 90s action movies usually contained consist of bar fights and motorcycle gangs, and this movies. 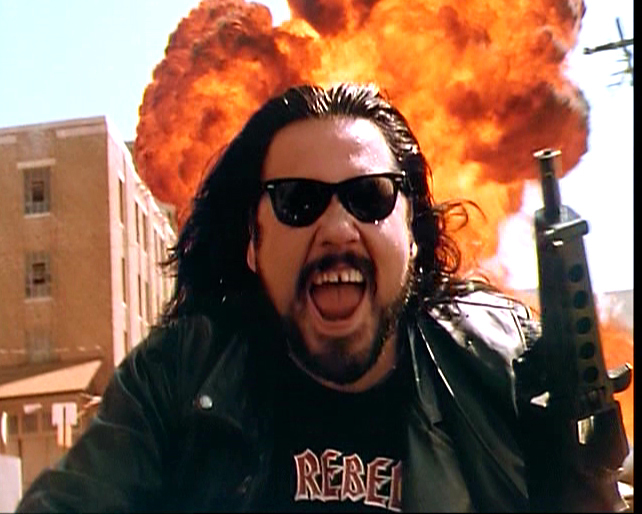 And this movie has both in spades so much, you'd think this was a a prequel to Sons of Anarchy. Of course, the fight between The Boz and pro wrestler Tom Magee may be the best and most memorable fight scene in the movie. For his first movie, he really doesn't do a terrible job. Considering his charismatic onfield persona, it's really no surprise he made the leap to movies. He's a naturally obnoxious and arrogant antihero in this movie. Had the action movie genre not run out of gas by this point and Boz had been given more roles and experience, he could've been a bigger deal. But, he jumped in at the wrong time. Shame because he had a great look. He could've come in handy in Hollywood eventually. 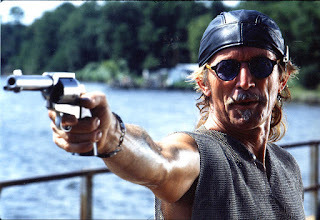 I'm actually very surprised he hasn't made an appearance in the Expendables at this point. Oh yeah, he also has a pet alligator in this film. Take that, Sonny Crockett. 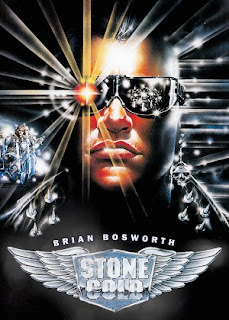 Stone Cold is one of those movies that really need to be owned by lovers of cult classics. Personally, I LOVE the movie Harley Davidson and the Marlboro Man. Which paired with this, would make a great double feature especially at film festivals, so a movie like this is right up my alley. It's definitely a welcome addition to my movie shelf. Fans for years have been hoping for a bluray release for years after the initial dvd went out of print. Now, while there are no features, the picture and sound are absolutely fantastic and make it for a enjoyable viewing experience. And the cover art, which you can see at the top of this article, may not be the original poster but offers an awesome alternative cover for fans. So turn up the surround sound, grab a bowl of popcorn and enjoy this forgotten classic which is available over at Olive Films and will be hitting the streets on June 23rd. Order this NOW! Are you paying over $5 per pack of cigarettes? I buy my cigs at Duty Free Depot and I save over 50% from cigarettes.